Changed in version 2.3: The whole way resource previews are handled was changed on CKAN 2.3. Please refer to previous versions of the documentation if you are using an older CKAN version. 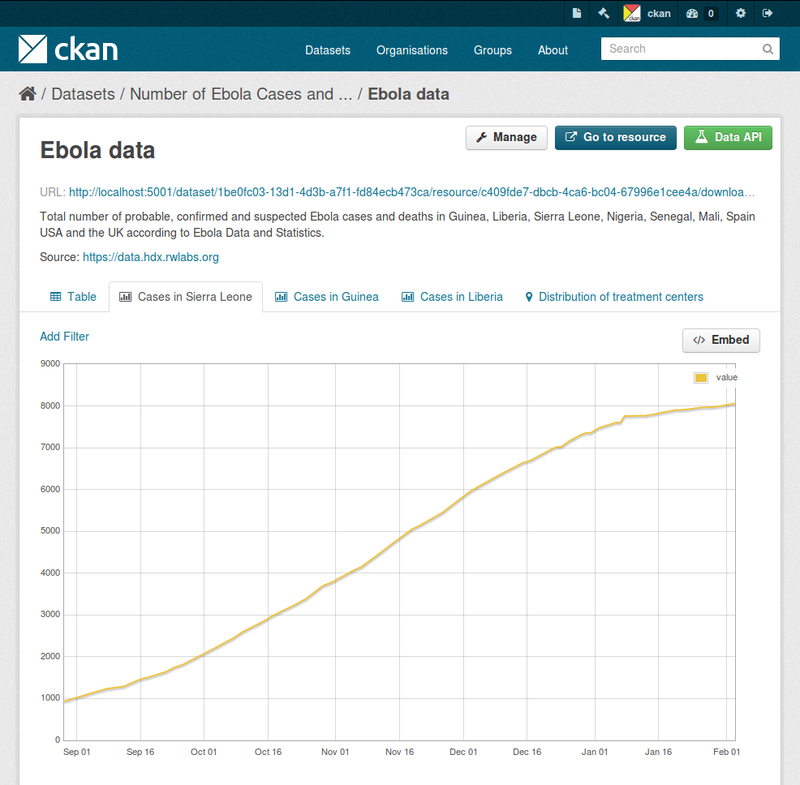 The CKAN resource page can contain one or more visualizations of the resource data or file contents (a table, a bar chart, a map, etc). These are commonly referred to as resource views. One resource can have multiple views of the same data (for example a grid and some graphs for tabular data). 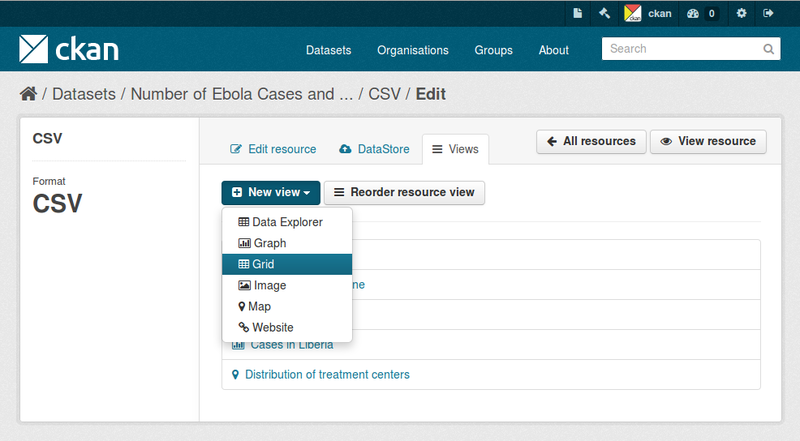 Dataset editors can choose which views to show, reorder them and configure them individually. Individual views can be embedded on external sites. Different view types are implemented via custom plugins, which can be activated on a particular CKAN site. Once these plugins are added, instance administrators can decide which views should be created by default if the resource is suitable (for instance a table on resources uploaded to the DataStore, a map for spatial data, etc.). Whether a particular resource can be rendered by the different view plugins is decided by the view plugins themselves. This is generally done checking the resource format or whether its data is on the DataStore extension or not. Users who are allowed to edit a particular dataset can also manage the views for its resources. To access the management interface, click on the Manage button on the resource page and then on the Views tab. From here you can create new views, update or delete existing ones and reorder them. From the management interface you can create and edit views manually, but in most cases you will want views to be created automatically on certain resource types, so data can be visualized straight away after uploading or linking to a file. To do so, you define a set of view plugins that should be checked whenever a dataset or resource is created or updated. For each of them, if the resource is a suitable one, a view will be created. This configuration does not mean that each new resource will get all of these views by default, but that for instance if the uploaded file is a PDF file, a PDF viewer will be created automatically and so on. Some view plugins for common formats are included in the main CKAN repository. These don’t require further setup and can be directly added to the ckan.plugins setting. The Data Explorer can also display certain formats of tabular data (CSV and Excel files) without its contents being uploaded to the DataStore. This is done via the DataProxy, an external service that will parse the contents of the file and return a response that the view widget understands. However, as the resource must be downloaded by the DataProxy service and parsed before it is viewed, this option is slower and less reliable than viewing data that is in the DataStore. 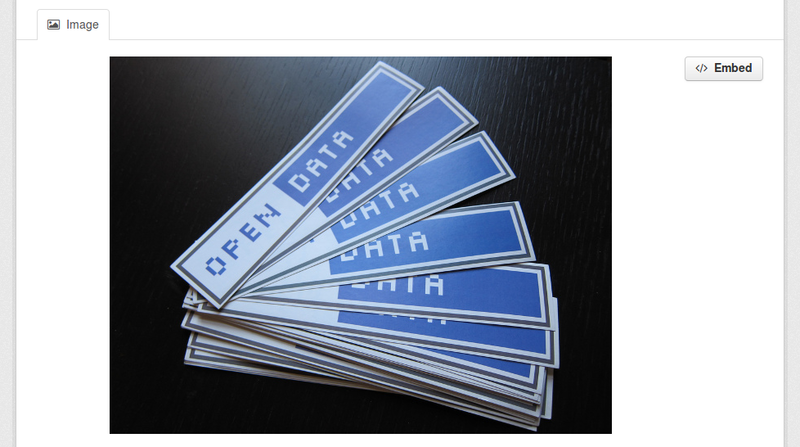 It also does not properly support different encodings, proper field type detection, etc so users are strongly encouraged to host data on the DataStore instead. 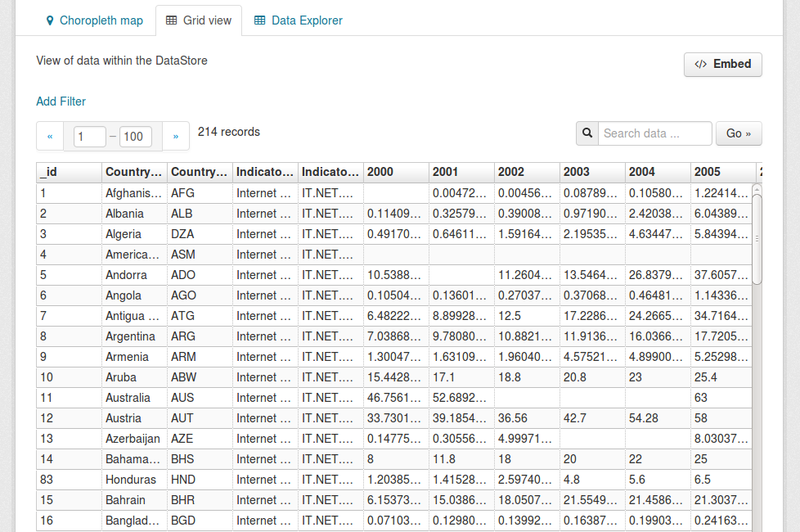 The three main panes of the Data Explorer are also available as separate views. 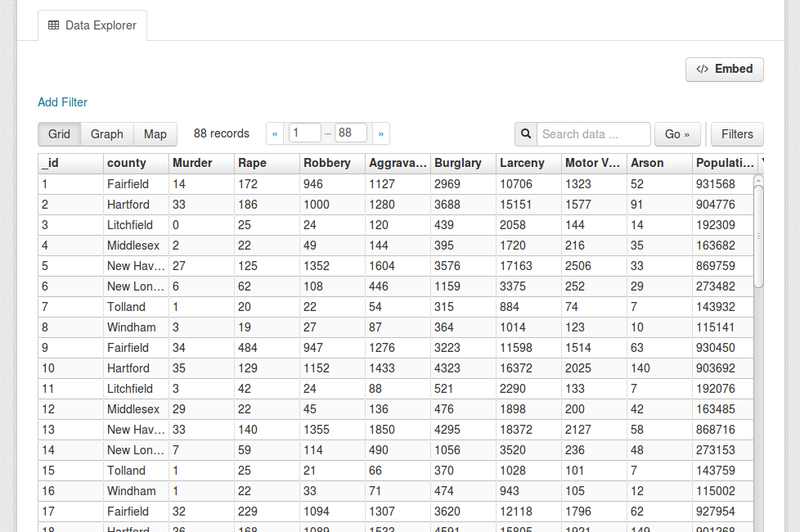 Displays a filterable, sortable, table view of structured data. This plugin requires data to be in the DataStore. 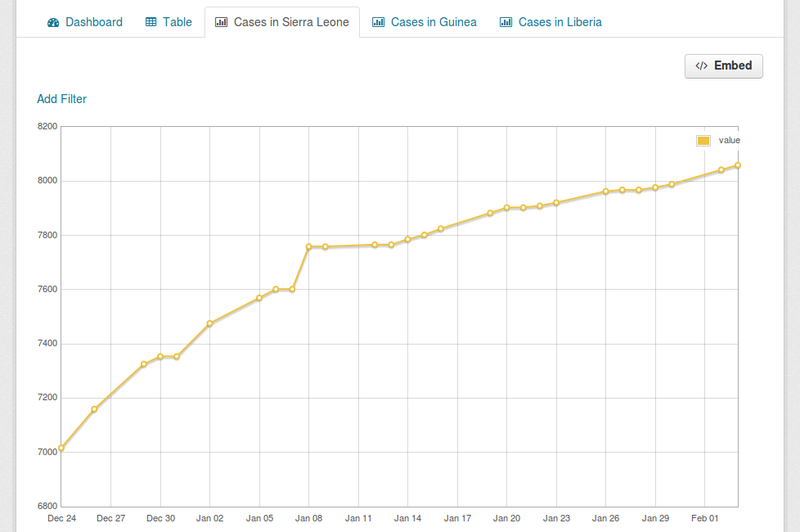 Allows to create graphs from data stored on the DataStore. You can choose the graph type (such as lines, bars, columns, etc) and restrict the displayed data, by filtering by a certain field value or defining an offset and the number of rows. 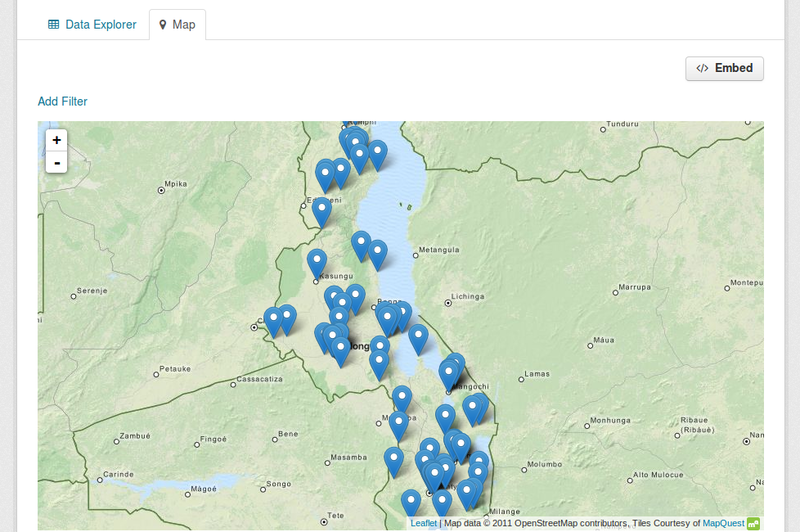 Shows data stored on the DataStore in an interactive map. It supports plotting markers from a pair of latitude / longitude fields or from a field containing a GeoJSON representation of the geometries. The configuration also allows to cluster markers if there is a high density of them and to zoom automatically to the rendered features. 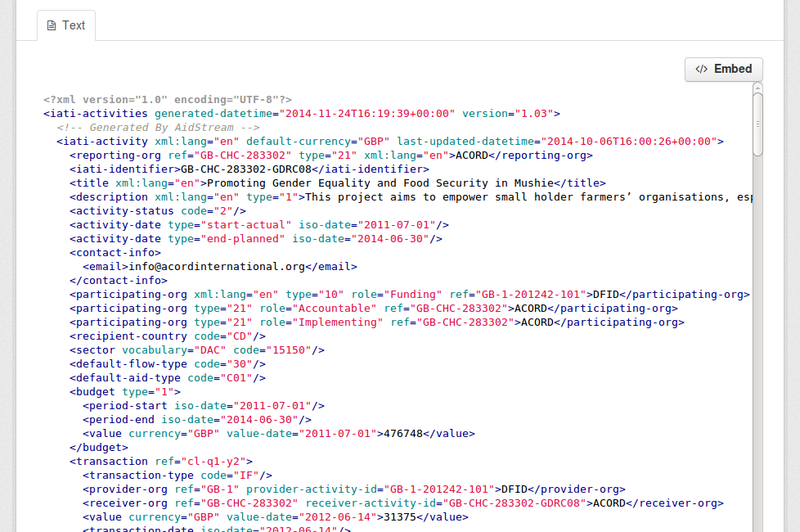 Displays files in XML, JSON or plain text based formats with the syntax highlighted. The formats detected can be configured using the ckan.preview.xml_formats, ckan.preview.json_formats and ckan.preview.text_formats configuration options respectively. If you want to display files that are hosted in a different server from your CKAN instance (eg that haven’t been uploaded to CKAN) you will need to enable the Resource Proxy plugin. If the resource format is a common image format like PNG, JPEG or GIF, it adds an <img> tag pointing to the resource URL. You can provide an alternative URL on the edit view form. The available formats can be configured using the ckan.preview.image_formats configuration option. Adds an <iframe> tag to embed the resource URL. You can provide an alternative URL on the edit view form. Do not activate this plugin unless you trust the URL sources. It is not recommended to enable this view type on instances where all users can create datasets. Dashboard: Allows to combine multiple views into a single dashboard. PDF viewer: Allows to render PDF files on the resource page. 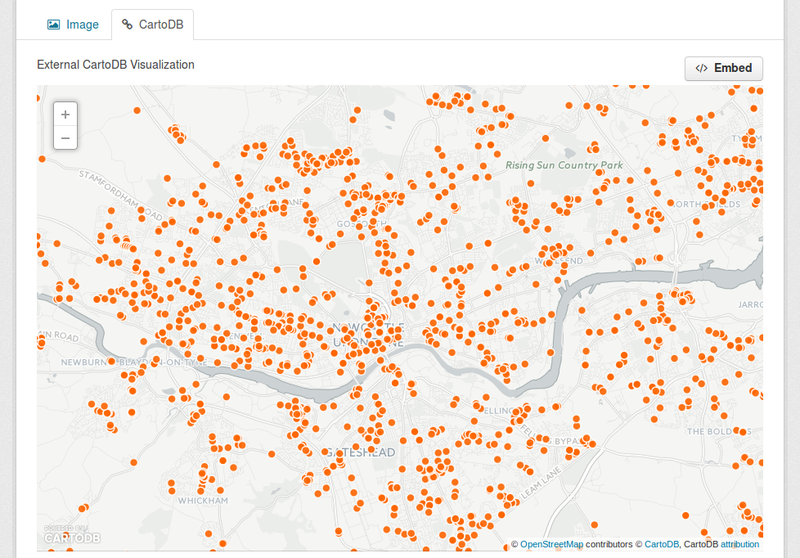 GeoJSON map: Renders GeoJSON files on an interactive map. Choropleth map: Displays data on the DataStore on a choropleth map. Basic charts: Provides alternative graph types and renderings. If you want to add another view type to this list, edit this file by sending a pull request on GitHub. New plugins to render custom view types can be implemented using the IResourceView interface. As resource views are rendered on the browser, if the file they are accessing is located in a different domain than the one CKAN is hosted, the browser will block access to it because of the same-origin policy. For instance, files hosted on www.example.com won’t be able to be accessed from the browser if CKAN is hosted on data.catalog.com . This will request the file on the server side and serve it from the same domain as CKAN. You can modify the maximum allowed size for proxied files using the ckan.resource_proxy.max_file_size configuration setting. If you are upgrading an existing instance running CKAN version 2.2.x or lower to CKAN 2.3 or higher, you need to perform a migration process in order for the resource views to appear. If the migration does not take place, resource views will only appear when creating or updating datasets or resources, but not on existing ones. The migration process involves creating the necessary view objects in the database, which can be done using the paster views create command. The paster views create command uses the search API to get all necessary datasets and resources, so make sure your search index is up to date before starting the migration process. The way the paster views create commands works is getting all or a subset of the instance datasets from the search index, and for each of them checking against a list of view plugins if it is necessary to create a view object. This gets determined by each of the individual view plugins depending on the dataset’s resources fields. On large CKAN instances the migration process can take a significant time if using the default options. It is worth planning in advance and split the process using the search parameters to only check relevant datasets. The following documentation provides guidance on how to do this. For certain view types (the ones with plugins included in the main CKAN core), default filters are applied to the search to only get relevant resources. For instance if image_view is defined, filters are added to the search to only get datasets with resources that have image formats (png, jpg, etc). If you set the ckan_logger level to DEBUG on your configuration file you can see the full search parameters being sent to Solr. The paster views command allows to create and remove resource views objects from the database in bulk. Tutorial for writing custom view types.